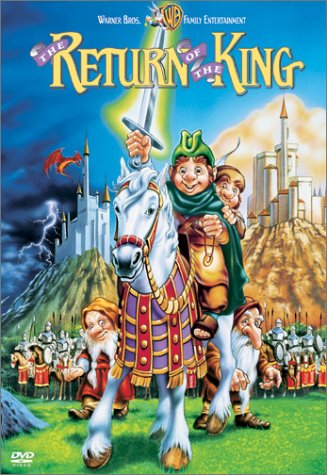 The Return of the King is an animated musical adaptation of the novel by J. R. R. Tolkien which was released by Rankin/Bass as a TV special in 1980. The film was created by the same team which had worked on the 1977 animated version of The Hobbit. It has since been released on VHS and DVD. Rather than picking up where Ralph Bakshi's animated adaptation of The Lord of the Rings had left off in 1978, Rankin-Bass presented The Return of the King as a sequel to their 1977 adaptation of The Hobbit, giving the audience an ultra-brief recap of the events ("Frodo and his friends had many exciting adventures before arriving in Mordor. "), and adapting a few story events from The Fellowship of the Ring and The Two Towers, while leaving out some major details. The visual style of The Return of the King is largely shared with the 1977 Hobbit, including, for example, the depiction of battle as a swarm of black dots milling around and quickly covered by huge clouds of dust. However, in the absence of an official sequel to The Lord of the Rings, The Return Of The King has come to be marketed as the final part of the animated Tolkien trilogy (with The Hobbit as part one and Bakshi's Lord Of The Rings as part two) even though the two films do not, however, join up seamlessly as both omit various segments from The Two Towers (notably Shelob's lair). Other omissions in the Rankin-Bass version include the characters of Gimli, Legolas, and Saruman. Aragorn is present but he has very little dialogue or screentime. Sauron's presence as an animated eye was somewhat similar to his appearance in the Peter Jackson films although limited by 1980s animation.